Ever since the surge of interest following the Mastercrafts programme broadcast in February 2010, things have been pretty hectic in the world of green wood chair-making. After a great run of courses last year, I settled down for the winter to complete the new book, which had been bubbling away for a few years. Despite having helped in making more than a couple of thousand chairs over the years, I found that while working quietly on my own, several innovations cropped up as the process evolved. This resulted in May with the publication of the 3rd book in the ‘Green wood trilogy’ entitled ‘Going with the Grain – Making Chairs in the 21st Century’. Due to a complication, which meant that it needed a new ISBN (the unique number for every book published) the book only became available in the mainstream book-sellers in July. We are delighted to say that it will also be distributed in the USA and Canada by Chelsea Green Publishing. This ground-breaking book takes a radical approach to working with unseasoned wood. Although it starts with the centuries old techniques of cleaving and shaving, it then incorporates modern technology such as tenon-cutters and cordless drills to enable anybody with basic hand skills and a few simple tools to transform a fresh log into a superb stool or chair. 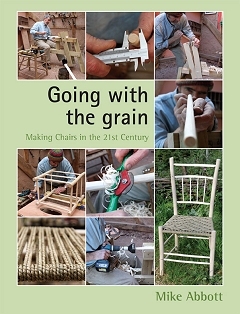 Because of its innovative approach, new tools and techniques are cropping up all the time, so to run alongside the new book is the new blog ‘goingwiththegrain.org’ in which we hope to keep abreast of any developments in green wood chair-making. For those who would like to see it all in action, the blog will contain short clips of film to bring it all to life. While all this has been going on, courses have been going very well at Brookhouse Wood, and this year’s main assistant Tom has fitted in very well making a great team with his fellow assistants Jack and Leo. All this activity has held up the announcement of the 2012 course programme, but at last it is available, and we suggest that if you are interested in a place on one of the courses, you book it as soon as possible, as there have been many enquiries over the last few months. You will find full details of the courses in the website www.living-wood.co.uk, which has been recently updated to reflect all this activity. If you haven’t yet discovered the delights of making green wood chairs, then I hope you will either purchase a book or come on a course sometime soon.